Reviews - Redirect Customers to a Specific URL After Review is Submitted? It is important to recognize the time your customers’ took to write the review and also letting your customers know that you appreciate their time and effort. Should you wish to craft your own thank you page, you can redirect customers to the custom page after a review is submitted. 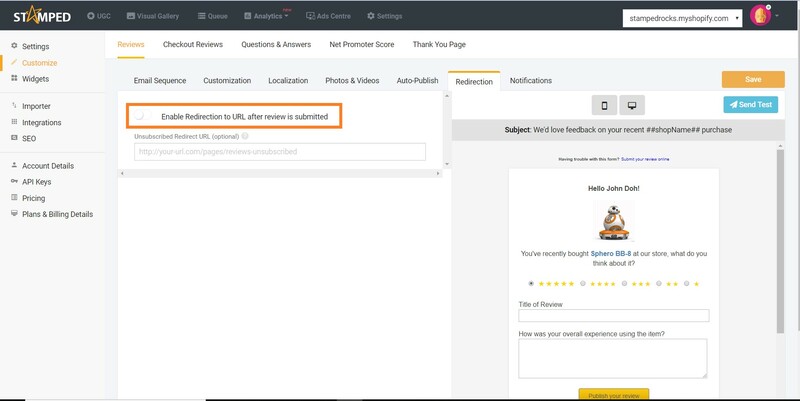 Apart from expressing your gratitude to your customers who have written a review, you may also choose to redirect customers who have given a low rating review to another specific URL. The URL could redirect customers to an ‘apology’ page which comes with a discount coupon code greater than the incentive coupon.